It's Easter time and as our thoughts turn inevitably to death and resurrection. We think of an individual that changed so many lives. A leader that died and came back to us. I refer, of course, to Captain Kathryn Janeway. A great many Star Trek characters have kicked the bucket and returned to tell the tale. Famously, on the big screen Spock copped it and came back for more, but only once. 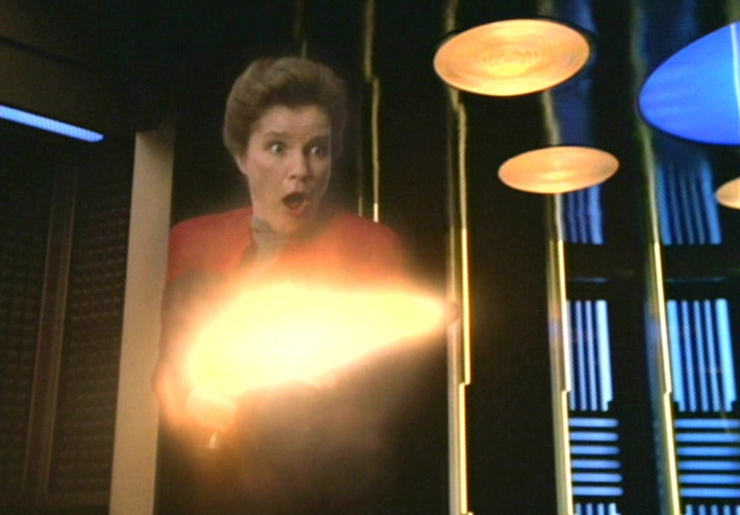 Until Harry Mudd trapped Gabriel Lorca in time loop to kill him again and again, Janeway held the record for the number of deaths she survived. She still has the most varied demises over the course of Voyager's seven year journey. In celebration, I wrote this for Hero Collector. "Look after the universe for me, I've put a lot of work into it"
I'm a big fan of Red Nose Day noses. I'm a big fan of Doctor Who. This year I have combined the two and written this for Hero Collector to mark the twentieth anniversary of the broadcast of The Curse Of Fatal Death. The Comic Relief Doctor Who story from Red Nose Day 1999, which featured Rowan Atkinson, Richard E. Grant, Jim Broadbent, Hugh Grant and Joanna Lumley as the Doctor. You can make a donation to Comic Relief here. 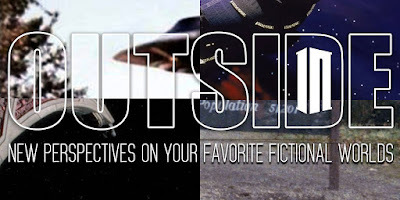 ATB Publishing have announced for more volumes of Outside In. I say announced, they've posted this image of four quarters of four photos from four different TV shows. Clockwise from top left, they are: The X-Files, Babylon 5, Twin Peaks and Star Trek: Deep Space Nine. My guesses for titles are: Outside In Wants To Believe, Outside In's Last Best Hope For Peace, Outside In's Damn Fine Coffee and Outside In Through The Wormhole respectively. I'm hoping to be a part of all of these. I wrote this for Hero Collector. I've always been fascinated by time loop episodes on TV. My wife hates time loop episodes on TV. Sadly, as a result of writing this, I've had to subject her to several of them. If it's broadcast by the BBC, it counts. Radio and webcasts are as valid as TV. Faith repels Ace's extended family. In the United States, you can mail live scorpions - if they are inside a box labeled "live scorpions", inside another box also labeled "live scorpions". He's just discovered that he is both the Eleventh and the Twelfth Doctor. It shook him to the core. The Jon Pertwee on the right is impressive, but the Beatrix Lehmann on the left is spectacular. Revealed in the new Private Eye, in shop today: the academy schools paying their heads £270,000, but refusing to shell out the London living wage for their cleaners. B'Elanna was the one taken by the Caretaker from Chakotay's ship, because he thought she might have what he needed. Maybe some of her DNA was left aboard the dreadnought from her earlier visit and that's why he transported it into the Delta Quadrant. "Donald Trump Was the Dumbest Goddam Student I Ever Had." My contribution to Outside In Takes A Stab is called First Among Equals and concerns the opening episode of Buffy, the Vampire Slayer's seventh and final season, Lessons. The episode sees a death in Istanbul, Xander helping to reconstruct Sunnydale High School and Buffy embarrassing Dawn during her first day there, Willow recuperating with Giles in England. Back at school the Summers girls encounter vengeful spirits and a mad Vampire with a soul in the basement. Once again, that's not really what I've written about at all. The final scene reintroduces the First, the Big Bad for the season. First Among Equals focusses on that last scene and boasts an exclusive behind the scenes look at the production of the episode. I guarantee you've never heard this anywhere else. Outside In Takes A Stab is available here. Colombia is in top gear. It shouldn't snow this time of year. They've come to save us, the space invaders. 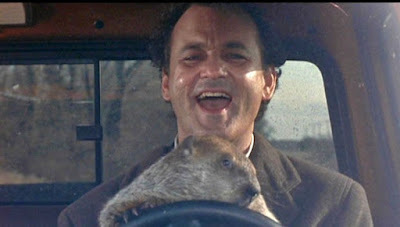 He thought of cars, but where, where to drive them and who to drive there with? Thanks to @MoTancharoen as well. Apologies for the vowel mix up. Here's hoping Star Trek: Discovery @startrekcbs gets the same treatment. The Doctor: "Hello beautiful. Did you miss me?" Yas: "This is gonna be fun." 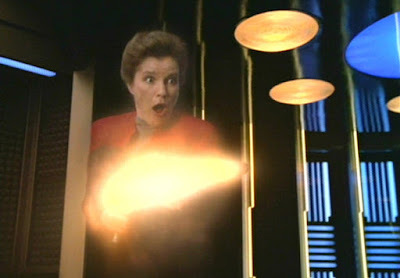 Is Rita cosplaying as Beverly Crusher?